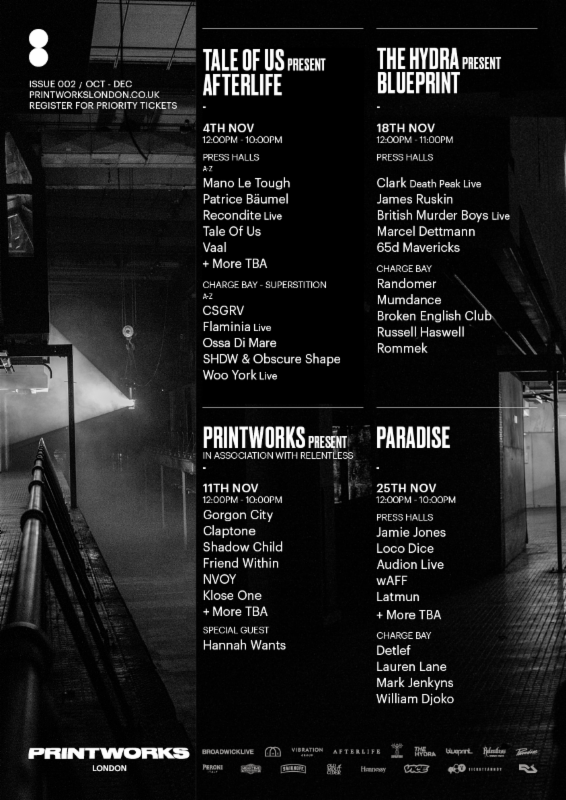 London’s Printworks venue has today revealed its long-awaited Issue 002 listings for November. Printworks, the venue that gave London its Berghain moment when it launched in February last year, has announced that in November it will play host to parties from Afterlife, Paradise and The Hydra. Kicking things off on the 4th will be Tale of Us’ Afterlife, featuring Mano Le Tough and Recondite, while Gorgon City host Relentless Sessions on the 11th alongside Claptone with special guest Hannah Wants. On Saturday 18th The Hydra present ‘Blueprint’, bringing James Ruskin, British Murder Boys and Marcel Dettman to the space then concluding the month of events will be Paradise on the 25th with Jamie Jones, Loco Dice, Audion and many more. Printworks have already released their reopening party line-up which takes place on 7th October with Maceo Plex, Rødhåd, Daniel Avery and more. See Printworks’ latest additions below, with the full Issue 002 line-up so far underneath.